Rooibos iced tea. Source: DWD. Recent warm weather (as well as plans to fly across the pond) have had me dreaming of all things light, cool and refreshing. Following on from my recent southern food obsession, I decided to try my hand at brewing iced tea. Here rooibos tea not only provides a beautiful smoky flavour and ruby red aesthetic, but it’s naturally caffeine free. It’s important to steep the tea for around 12 hours, and once brewed it will keep in the fridge for at least 4 days. Method: In a large container or bowl, add the rooibos tea and 1l of water. Allow to brew for at least 12 hours, covered, in the fridge. Add the sugar, 1 lemon, mint and 200ml of water into a small saucepan. Over a medium heat, stir continuously until the sugar has dissolved. Once dissolved, bring the syrup to a rolling boil and simmer for 10 minutes, until it reaches the consistency of olive oil. Pass the syrup through a sieve into a sterilised, sealable bottle, using the back of a wooden spoon to push all of the liquid from the lemon and mint leaves (which will be quite mushy) through. This will keep for up to two weeks in the fridge. To serve, use a ratio of 1:4 syrup to brewed tea. Add the syrup over crushed ice and stir. Add the iced tea and top up with ice if required. Serve with half a slice of lemon and a sprig of mint. The coffee bean as we know it is the seed of a cherry-like fruit known as cascara. This fruit is usually discarded and at best broken down and used as a fertiliser. It can. however, be dried and brewed as a tea or used to create a cold brew. Coffee roasters Has Bean and Square Mile currently retail this dried fruit. 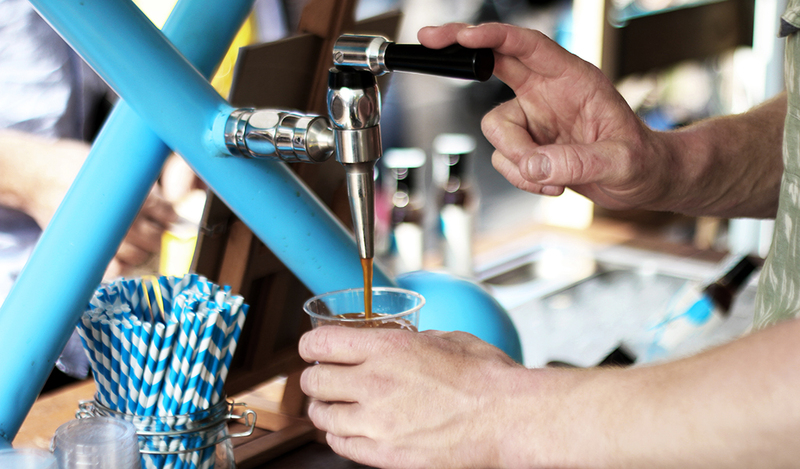 During the brewing process much of the cascara’s flavour and caffeine diffuses into the surrounding fluid, whether it be water in a tea or fruit juice in a syrup. 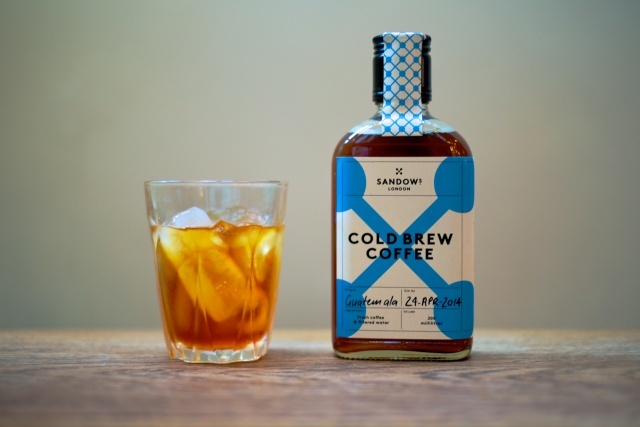 The cascara in this recipe, from Square Mile, displays a delicious rose-hip sweetness. Here, I have steeped the cascara with pomegranate juice to form a fruit syrup/cordial. 1. Add the cascara and pomegranate juice to a pan on a medium heat for 20 minutes, stirring frequently and not allowing to boil. 2. After 20 minutes, pass the cascara-pomegranate mix through a sieve and set to one side. (The reason the blood orange juice isn’t added at this stage is so that it maintains it’s natural flavour, un-affected by the cascara). 3. 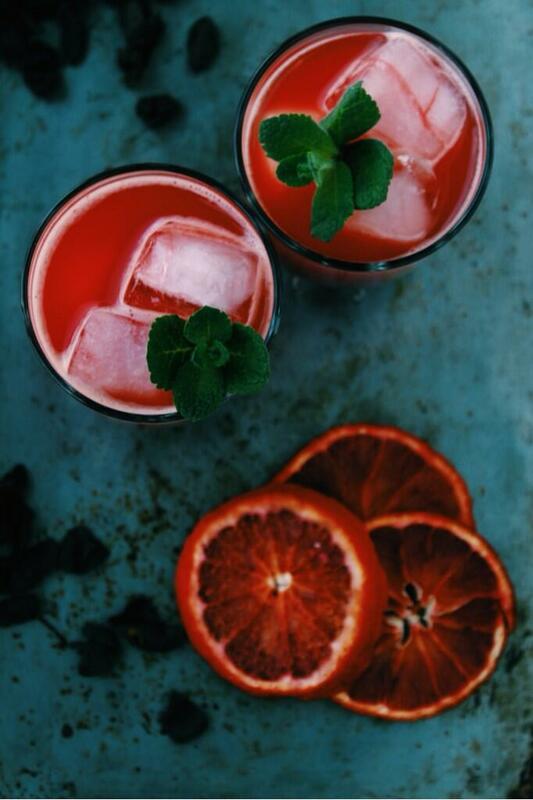 In a large pan add the fresh blood orange juice and zest as well as the sugar and cascara-infused pomegranate juice. Stir the sugar until it has dissolved. 4. Over a high-medium heat reduce this mixture by half to form a glossy syrup. When reduced, place the syrup through a muslin cloth and store in a sterilised bottle or jar. 5. To serve, add 1 part syrup and 2 parts sparkling water over ice. Add a small bunch of mint and enjoy! 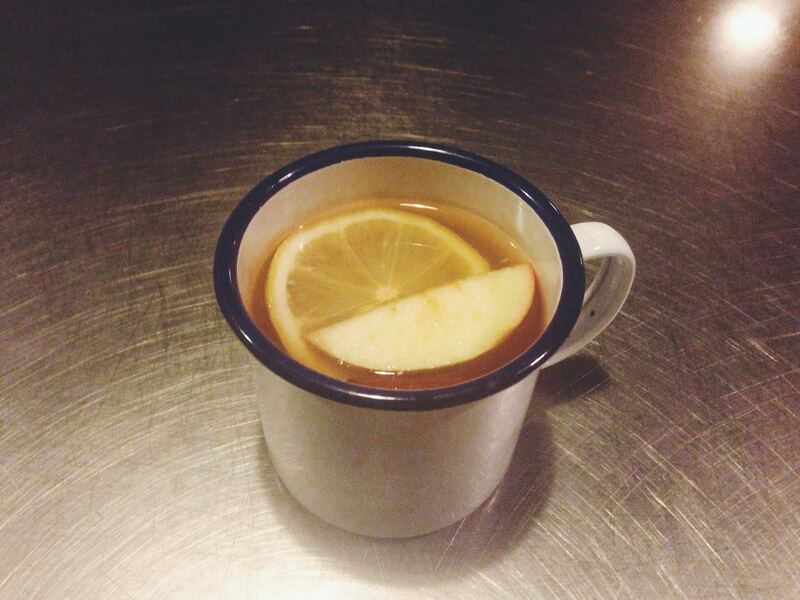 Until recently I thought this honey, whiskey and lemon combination was a drink exclusively for victims of winter’s illnesses, or those with trouble sleeping. That was until a Canadian baker I had the pleasure of working with suggested it as a festive alternative to a beer, for marking the end of the week in the bakery. Admittedly I had to do some reading, as I wasn’t entirely sure of a reliable hot toddy formula. Eventually I found one, and as Friday arrived, so too did the hot toddies. 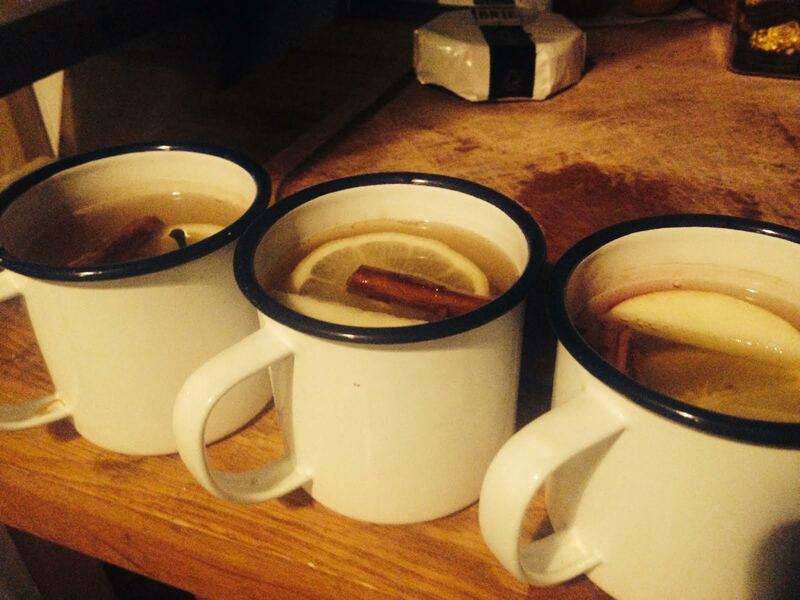 We added a slice of apple to ours, providing not only the delicious smell of spiced cider, but a little treat at the bottom of the cup when all the whiskey has been washed away. Add all the ingredients, besides the hot water into a mug. Pour over just-boiled water (90/95c) and give a good stir. The reason for using water that isn’t boiling here is that if it is too hot, the whiskey’s alcoholic properties can deteriorate, which isn’t very jolly at all. Best enjoyed with Christmas Wrapping by The Waitresses. Merry Christmas everyone!